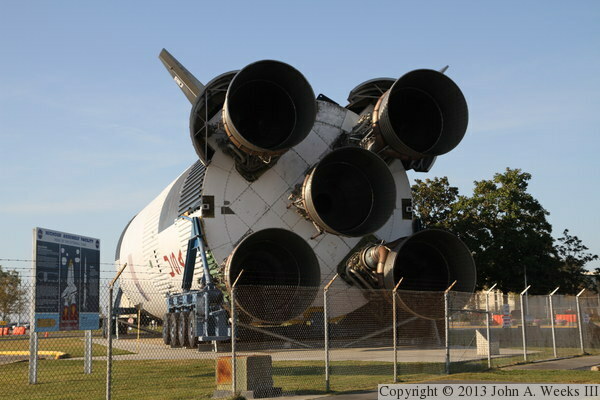 This is the first stage from Saturn V vehicle SA-515 on display at the NASA Michoud Assembly Facility in New Orleans, Louisiana. Vehicle SA-515 was originally in line to be used for the Apollo 20 flight to the moon, but that flight was canceled before the hardware was complete. SA-515 was retasked as the backup launcher for the Skylab space station. Later, it was proposed to launch the backup Skylab as a follow-on mission using this rocket. The SA-515 stages were retired in the late 1970s and put on display, with the first stage staying at Michoud, and the second stage going to Houston.